Arguably one of the most sought after cottages in the Adelaide Hills and sure to impress Oats Cottage is available to suit the needs of both long and short term visitors with rates negotiable dependant upon duration of stay. Whilst nestled in the heart of Hahndorf and yet only a short 25 minute drive to Adelaide, 'Oats Cottage' is within a minutes walk to the many restaurants, cafes, pubs and boutique shops, that the historic town of Hahndorf has to offer. The added bonus is that Oats Cottage is actually in Hahndorf itself which has been voted Australia's 16th most visited attraction and voted as the 2nd most visited destination within South Australia. We offer affordable and spotlessly clean accommodation designed to make you feel that Oats Cottage really is home from home, all you need to bring is your suitcase! Sit and relax on the front verandah toasting the ambience of Hahndorf whilst the snags are gently cooking on the BBQ on the deck at the rear. Take a stroll to the main street via a private thoroughfare and soak up the quaintness that Hahndorf has to offer. Located within close proximity to some fabulous wineries this is the place that offers everything whether it be the City or the Hills! This cottage is immaculately presented, kept spotlessly clean, and you will love it! Please note.... Oats Cottage is a quality fully furnished Cottage in the centre of Hahndorf and is located exclusively within its own grounds as opposed to a motel, annex to another house or a unit in a complex, thus providing guests with the upmost privacy yet so close to all the attractions! We have also been established for a number of years and pride ourselves on providing quality yet affordable accomodation. Oats Cottage is a quaint, comfortable, small cottage and not suitable for large groups or persons needing that extra room or three! We have in excess of over 300 glorious and simply beautiful testimonials recommending Oats Cottage to others with a high number of guests returning year in, year out, which simply says it all! To celebrate your stay at Oats Cottage a quality bottle of South Australian wine is provided as are tea/coffee and some toiletries. Our calendar is updated daily and we guarantee to reply to all enquiries within 24 hours. Lounge room with quality leather sofa,, large wall mounted plasma and blu-ray DVD player with selection of dvd's. Main bedroom with quality furnishings leading into walk through robe and main bathroom. Large SPA bath, separate shower cubicle and vanity area (hair dryer supplied). Dining/kitchen - fully equipped (filtered water, luxury coffee machine, slow cooker etc...). High chair and travel cot (at no cost but please supply own baby bedding). Laundry room with front loading washing machine and ironing facilities. Aircon and electric blankets for the winter period! Undercover decked area to rear. Car parking for 2 x cars. Private access to Hahndorf main street within a minutes walk, you will not find a more centrally located guest house in Hahndorf! There are no hidden extra's included (i.e cleaning, bond etc...which makes Oats Cottage a cut above the rest whilst remaining excellant value for money! Very well appointed and kept. Location great. As soon as my husband and I put our bags down we felt comfortable and relaxed. The cottage was spotless and fresh flowers, and a bottle of wine just added to the feeling of welcome we had. Everything was in good condition and easy to use. 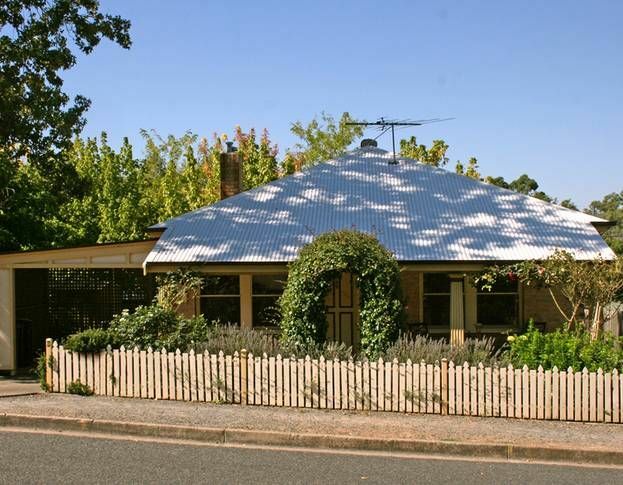 The cottage is a very easy quick walk to the main street of Hahndorf. We loved our stay, the bath is amazing and the shower is wonderful. We are already trying to see when we can get back to this amazing little cottage in the hills. Why Live In A Hotel? Why Live In A Motel? Why live in a hotel with flunkies running hither and thither, no one really listening to you? Why live in a motel, your room is a box 4mX4m? In Reception there's no one listening to what you have to say! Come up a level or two to Oats Cottage, Hahndorf. Music wafts from the radio. Birds call from the lush garden. One street from the main road, but quiet as a country lane. Every fixture and facility more than suffices. The guest books tell you that you've arrived at the best. Why settle for less, at such reasonable cost? Absolutely loved our stay. Everything was just perfect. So comfortable, inviting and homely. A home away from home. Hahndorf is such a magnificent little town, and staying in such a great little cottage made our stay very memorable. Thankyou Mike and Kate, it was lovely meeting you ! and we will be back!! We had a lovely long weekend at Oats Cottage. On a cold day, it was much appreciated that on arrival, Mike had already put the heating on for us. The cottage is certainly equipped for long stays, with almost every convenience of our own home - except for the spa bath, of course! The location was ideal as we could walk along the main street of Hahndorf without worrying about parking. The Artwine cellar door recommendation by Mike was spot on - loved the wine, location and Coco, the dog. Close to Hahndorf Hill Winery too - my new favourite Adelaide Hills winemaker! Thanks Mike & family, we will certainly be returning- soon hopefully! We loved Oats Cottage - it was very well equipped, comfortable, clean and perfectly positioned... a minute to walk to the main street, but without the noise and traffic! Mike was an attentive host and had everything organised, with effective communication and follow up. We highly recommend this property to others.